Some individuals are more prone to tooth decay. For instance, premolars and molars can sometimes have deep grooves or pits that harbor debris and bacteria. However, preventive treatments, such as dental sealants, can help patients keep their teeth and gums healthy. Dr. James Slaman can provide dental sealants at our Albuquerque, NM, practice to protect teeth from harmful bacteria. Both children and adults can benefit from this treatment and it can be performed during your routine dental cleaning and exam in just minutes. When you go outdoors on a stormy day, you probably wear a raincoat to protect your clothes from the elements. Dental sealants work in a similar fashion, as they shield the teeth from plaque and tartar. The procedure is completed by applying a thin, clear protective coating to the chewing surfaces of the teeth. Although sealants are not a substitute for proper brushing and flossing, they are an excellent supplemental treatment that can help protect teeth from cavities and prevent food from becoming trapped in hard-to-clean areas. Without the protection of dental sealants, teeth are much more vulnerable to decay and damage. 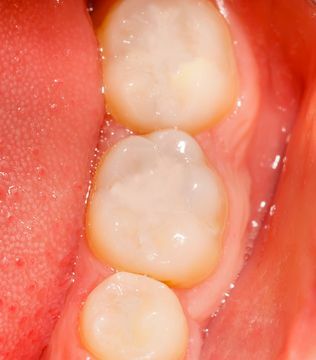 Without the protection of dental sealants, teeth are much more vulnerable to decay and damage. Sealants are also incredibly successful. In fact, they can reduce the risk of molar tooth decay by up to 80 percent. In addition, they are more cost-effective than dental fillings, which must be placed once teeth are irreversibly affected by decay. Therefore, dental sealants can help save you money, time, and worry in the future. Many patients are under the impression that dental sealants are only for children. On the contrary, this preventive measure is helpful for individuals of all ages. Sealants are common in pediatric dentistry because the enamel on baby teeth is not as strong as the enamel on adult teeth. Therefore, the extra layer of protection helps prevent damage. In addition, young patients are much more prone to tooth decay. According to the Centers for Disease Control and Prevention, 21 percent of children aged six to 11 have cavities. This number grows to about 60 percent in those between the ages of 12 and 19. Therefore, sealants are an excellent choice for adolescent and teen patients. We routinely recommend dental sealants for adults as well, particularly if there are troublesome areas that tend to harbor food and debris. In addition, sealants can be helpful for protecting teeth with small cavities from further damage. Receiving dental sealants is an incredibly simple and straightforward procedure that can be completed in just a few minutes in our office. Before applying a sealant, Dr. Slaman will thoroughly clean your teeth to eliminate any plaque, tartar, food, and debris. Next, a mildly acidic gel will be applied to teeth to create a strong bonding surface for the sealant. Dr. Slaman will then rinse off the gel and thoroughly dry the teeth. Finally, thin plastic-like coatings will be carefully painted onto the teeth and hardened with a dental curing light. Typically, patients will be able to resume normal eating and drinking as soon as the appointment is complete. Millions of patients worldwide benefit from dental sealants as part of their oral health care. To find out more about dental sealants or other preventive treatments, such as cleanings, examinations, and fluoride, patients can schedule an appointment with Dr. Slaman at our Albuquerque practice. Contact us online or call our office at (505) 881-7586.